I’m not one for hot weather. Don’t ask me why I moved to Florida of all places. So I’m usually hanging around inside and staying out of the heat during these hot summer months. But when I do go out, the high heat has me running to a few summer standbys and I came to realize that I reallylike coconut. I’m actually running low on the small bottle I have of this. And while many Creeds escape my understanding, Virgin Island Water remains one of the best interpretations of coconut I’ve smelled yet. I’m looking for other (preferably more affordable) alternatives. But until then, I’ll keep riding the sliver of fragrance I have left in the bottle of this perfume. Vanilla and coconut has been done to death in the fragrance world. I love the combination so I’m happy to have the myriad of choices. And if I were to grab a cliche, it would be this one because it’s a very nicely composed fragrance with a tropical feel–perfect for these summer months! I like what I like and I happen to really like this. Painfully simple, very affordable, and comes in a huge bottle. Coconut Lime Verbena reminds me of clean, fresh leaves. I had a bottle of body wash in this fragrance and used that up in a couple of weeks. I can’t get enough of this stuff and it just screams summer to me. Maybe it’s because my mother had cravings for coconut when she was carrying me. Or maybe it’s all the coconut I ate as a child. Or maybe it’s the sheer frustration of not being able to get my hands on a good coconut despite being so close to the tropics but I’ve really been craving these three particular fragrances lately. I LOVE coconut. As in “eat”. When it comes to perfumes I’m probably fine with some amount of it. My very favorite perfume in that genre is Bronze Goddess by Estee Lauder. When I saw the name of your post in my Inbox I was sure you were reviewing Love Coconut by Honoré des Prés. Have you tried it? I can’t say that I like it (though there are no strong negative feelings either) but many people liked it a lot. I love everything about coconut and haven’t had a really fresh one in over a year. 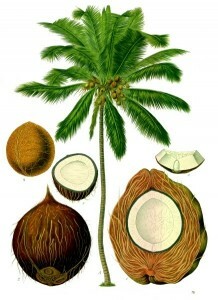 It’s sad that finding a good coconut in Canada during the winter was a lot easier than finding one now. I have not smelled Bronze Goddess before, but I have had the opportunity to on a couple of occasions. I haven’t looked into it so I didn’t know it had a bit of coconut in it. I also haven’t tried Love Coconut yet, but thank you for bringing it up! I’ve been on the lookout for coconut scents that topped Creed’s Virgin Island Water because that stuff is expensive and doesn’t last at all. So suggestions are very much appreciated. It was probably about 4 years ago that I purchased Creed’s Virgin Island Water. That’s all I wore one summer. It reminds me of going on a Caribbean cruise. Love it!!! Virgin Island Water seems to be all I’m wearing this summer too! 😀 It reminds me of drinking a coconut on the beach.